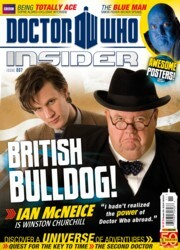 This month Ian McNeice reveals his delight at being part of the extended Doctor Who family, following his return to Doctor Who as Winston Churchill in The Wedding of River Song. �ACE IN THE 80�S - Sophie Aldred shares her memories of playing groundbreaking companion Ace opposite Seventh Doctor, Sylvester McCoy. �THE DOCTOR�S WHEELS - Whilst exiled on Earth in the 1970�s, the Doctor acquired two very different vehicles to transport him too and from his adventures � Bessie and the Whomobile. Insider investigates the real life story of both cars, revealing their origins and attempting to find out where they are now. �DORIUM�S DELIGHT - Simon Fisher‐Becker couldn�t be happier to be playing blue man, Dorium Maldovar. Insider finds out why. �I WAS... ADOLF HITLER - Albert Welling tells Insider what it was like to play the most hated man in history in Let�s Kill Hitler. �NEXUS POINT - Whilst on trial by his own people, the Time Lords, the Sixth Doctor is slightly surprised to discover that his prosecutor, the Valeyard, is in fact a future version of himself! �DATA FILE - We take a look at the life of the whimsical Second Doctor and his companions. �TIME SCOOP - Insider follows the Doctor and his companion Romana on their quest for the six segments of the Key to Time. �MERCHANDISE - Previews of the latest Doctor Who merchandise, including the special edition of The Talons of Weng‐Chiang on DVD. Authors Emma Beeby and Gordon Rennie tell Insider how they wrote Big Finish Productions� new audio drama The Doomsday Quatrain, featuring the Seventh Doctor. And writer Naomi Alderman explains how she plays tricks with time in her new Doctor Who novel, Borrowed Time. �FAN ZONE - Insider presents a special report on this year�s Comic‐Con event in San Diego where Doctor Who was featured in a big way! PLUS! The latest official news and a giant, double‐sided poster of the Eleventh Doctor with Winston Churchill and the Second Doctor.